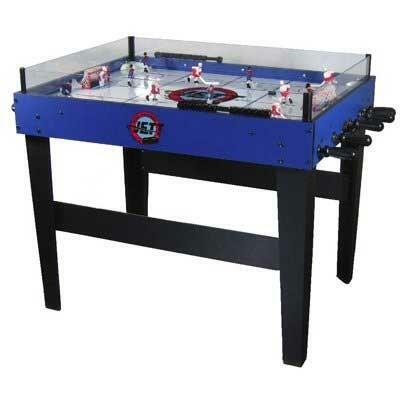 Face-off for some exciting hockey table action with the Ice Raider Rod Hockey table from Jett Games. This solidly constructed table features carbon fibre rods with large handles for great stick handling. The red players vs blue players are 3 dimensional with painted details. Official rink markings and transparent rink walls make this feel like a real rink. Jett takes Rod Hockey to a new level with full size 31” x 42” playing surface. A great family table at an incredibly low price! Comes with 2 pucks and 4 extra players. Dimensions: Approx. 43.5'' L x 32.5'' W x 34'' H Weight: 85lbs.